Welcome back to another episode of The Modern Bar Cart Podcast! This time around, we have another awesome interview from our recent Lost Angeles road trip, where we had the opportunity to tour Lost Spirits Distillery with co-founder Bryan Davis. In this TEDx talk, Bryan Davis gives us a glimpse into his background as an auto-didact and entrepreneur, leading to his recent innovations in accelerated barrel aging. Bryan Davis is a veteran of the spirits industry. Along with his partner Joanne, he created a successful Absinthe brand (Obsello), and then moved to Monterey County, California in 2010 to create Lost Spirits Distillery. They then moved their growing operation to Los Angeles in 2016. Lost Spirits is known for cutting against the grain and using technology to accelerate barrel aging, creating innovative, award winning spirits that would otherwise take decades to mature. Bryan and his team experiment across categories—rum, whisky, and brandy are all part of their current offerings, with many more experiments in the queue. In this episode (Part I of II), Bryan takes us on a tour of Lost Spirits and tastes us through a number of his delicious products, alongside his computerized sidekick, TESSA. This episode, we’re going to be drinking some rum, so we thought it might be fun to feature one of the most beloved rum drinks of all time: Planter’s Punch. There are a lot of different hypotheses about where this cocktail comes from, and almost as many variations on the recipe, so don’t worry about swapping out ingredients if you need to--it’s all but encouraged. Combine all these ingredients in a cocktail shaker with ice, give it a good, vigorous shake, and then strain into a rocks glass over more ice. For a garnish, throw in a pineapple wedge, a citrus wheel, or some mint if you’ve got a sprig hanging around. It’s a mellow concoction that’s perfect for warm or cold weather sipping, and it’s also super easy to batch for large gatherings where you break out the ol’ punch bowl. 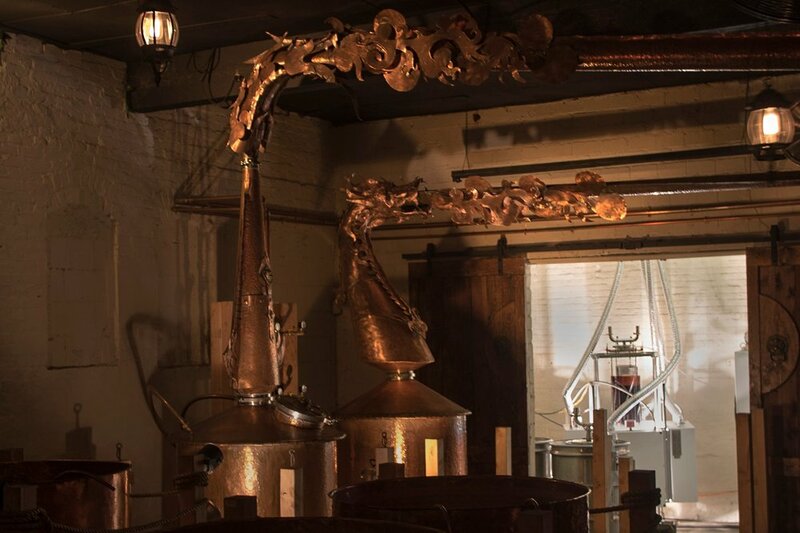 This episode is an interactive virtual tour of Lost Spirits Distillery in Los Angeles, CA. 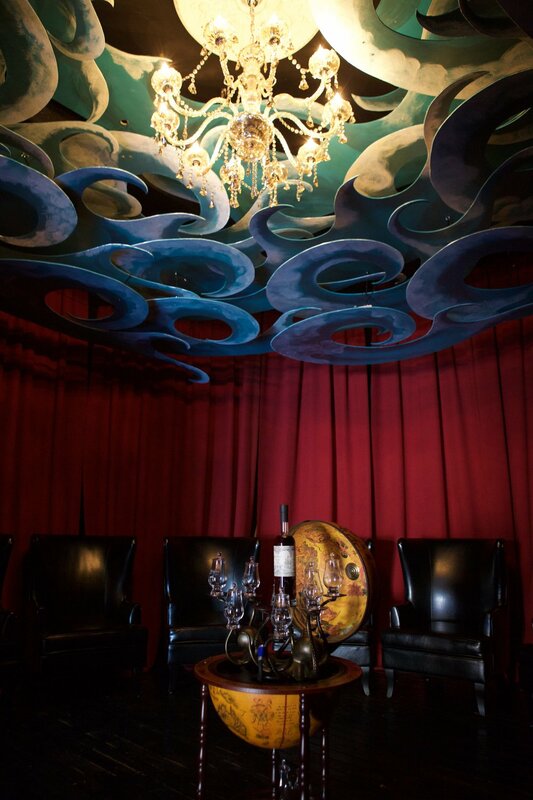 We begin in a chartroom-style room encircled by ornate, high-back armchairs, where we tasted Lost Spiris’ Navy Rum, weighing in at 68% ABV. This is a heavy, Guyanese-style pot still rum with notes of boat tar, gun powder, and dried tropical fruit. During this part of the tour, Bryan explains how sailors in the British navy “proofed” their alcohol, ensuring that it was safe to take aboard and wouldn’t ruin the gunpowder if it was spilled during battle. The next stop on the tour requires a ride on an actual boat, which floats on the water reservoir used to fill the mash tuns and cool the condenser on Bryan’s pair of ornate, hand-made stills. This use of water serves two functions: A.) it creates an environmentally friendly heat sink, and B.) the humidity plays foil to Los Angeles’ dry atmosphere, generating a tropical micro-climate more true to where rums are normally distilled. This is where the magic happens. According to Bryan, it’s the most interesting room in the distillery, filled with clinking devices that he invented in 2014 and patented in 2015. These machines accelerate the process of barrel aging by heating the booze up with the wood, extracting a catalyst that initiates the process of stearification. Then, the liquor is transferred to another machine that uses intense light to quickly degrade the American oak staves, which are sourced from a cooperage in France. After checking out Bryan’s proprietary technology, we tasted a Jamaican high ester rum, and Bryan explained the importance of the age-old battle between yeast and bacteria, where humans are recruited as an asset to allow the rapidly-evolving yeast to maintain the upper hand. Essentially, yeast have adapted a few key superpowers to help them beat back the advance of quick-spawning bacteria. One is that they have learned to speak bacterial languages, emitting short-chain fatty acids that tell bacteria to stop reproducing. The other (and more important for this rum) is that they have learned to create an enzyme that allows them to bind an alcohol molecule to their short-chain fatty acids, turning them into a compoud called an “ester.” Esters are responsible for the fruit smells and flavors we associate with all our favorite foods and drinks. The upshot? Instead of smelling something nasty and rotten, we smell something that reminds us of mango, or pineapple, or blackberries. And then we try to reproduce that flavor, which requires more yeast, and thus the cycle continues. After touring Lost Spirits’ lab space, where we saw their gas chromatograph and mass spectrometer, we headed off to the last stop on the tour: Whisky Island. This room is modeled after The Island of Doctor Moreau, who is an H.G. Wells character who conducts grotesque experiments on animals and humans. This is where we tasted their Abomination Whisky (Sayers of the Law expression), which is made using an 18 month Islay Scotch that is aged using a process designed to imitate aging in a late-harvest Riesling barrel…which doesn’t exist. Thus, the abomination.